I’m pleased to announce the ‘alpha’ release for my Herald Battle Reporter software. You can read all about Herald here on my blog or you can just jump right in and start playing with the tool by clicking on the link below. As a result, I’m putting in this final post that shows what the finished model looks like along with a quick reference for painting. Wood: a dark brown base (Rhinox Hide), shade with black and drybrush with lighter brown (e.g. XV-88) and bone colors. Moss: a dark green base (Caliban Green), then drybrush with mid-green (Warboss) and yellow. Window: paint the interior black, and the exterior with the grays used for the stone. Use a large brush for all of your painting and drybrushing here. Don’t spend your money on expensive brushes as the paint job doesn’t require them and the textured paint and sand will fray the ends. You can purchase half-inch flat brushes pretty cheaply in any arts and crafts store, and I suggest you use those. 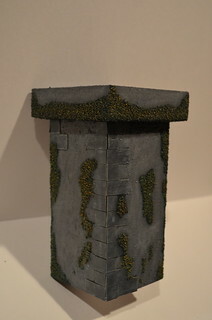 I’ll be building a second Watchtower model to match this one, and showing how to make a (better) base for it, along with using magnets to enable re-positioning of the towers so that your scenery doesn’t look the same every time. I also intend to build some good extra pieces to combine with the Watchtowers for the same reasons (e.g. crenellations, battlements, ladders and so forth), and as I build them for myself I’ll make sure and take photos and include a how-to guide here on the blog. 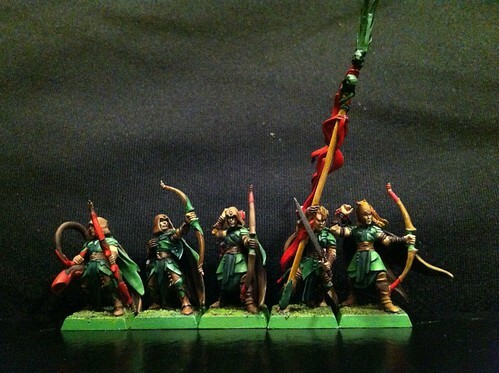 I’ve finished the first five of the Wood Elf Glade Guard (this is likely the front rank). You can see that I switched my medium/leather brown for the fifth elf (on the far right). I’m not happy with either the Privateer Press brown or the Citadel one (I was recommended XV-88 by the GW staff member), so I’ve now bought a few Vallejo Model Paints to try. Expect an upcoming article soon where I paint three identical cloaks using five paints from each manufacturer in a nail-biting Mega Cloak Paint-off! Ahem. Sorry, got carried away. These fine chaps are the Tactical Squad of Dark Angels from the Dark Vengeance boxed set. Not the best of photos (little bit too much depth of field) but it gives an idea. 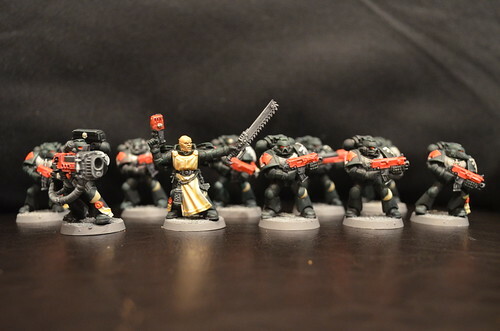 I’ve marked them up as 6th Company, 1st squadron (which I think technically makes them veterans, but whatever – 1 is easier to paint than just about any other number). 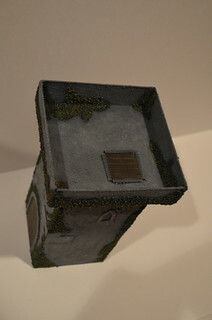 In this part of the tutorial, we’ll be adding detail to our watchtower that we built in Part I. By the end of this stage, your watchtower will look something similar to the one on the left, which I’ve posed with a couple of Glade Guard to give an idea of proportions. I’ve sprayed this one in black, ready for painting (coming in Part III). My local Jo-Ann Fabrics sells big bags of sand (for making pretty flower arrangements I think) that cost $3. Glue I’m using is Elmer’s Glue-All, and I’m using Citadel’s Chaos Black spray, but any spray that works on card is fine. The chipboard and card stock is from the same pack I mentioned in Part I.
Technically, the moss is going to be added at several points. One thing I like to do when I’m gluing anything is to put more glue on than I need, and glue some extra texture on at the same time. 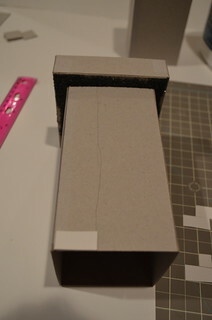 As I mentioned in Part I, I start this when I’m gluing the roof to the tower, as seen in this image. Make sure when you are applying sand to use a solid container to catch all the sand in. That way you can pour as much as you like on to ensure coverage of the glue, and then tip the remainder back into your sand container. 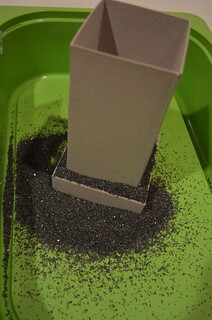 After pouring, leave the sand on the tower for at least 15 minutes (there are other stages which can be completed during that time). One of things you’ll notice once you tap off all the sand is that it didn’t stick everywhere there was glue. In fact, over the course of making the model, little bits will continue to flake off. This is pretty normal, and there plenty of ways to deal with it that I’ll go into during each stage. I’m unconcerned with the sand underneath the eaves of the roof because you won’t ever really see under there during the normal course of events. Now that we’ve got the tower glued together with some moss on the eaves, let’s add some bricks. Take some of your regular card stock–I’m using white to make it easy to see in the tutorial, but you can use any color as it’s going to be painted anyway (black is maybe a better choice)–and cut a strip that is 1″ wide, assuming that you’re using a piece 12″x12″. 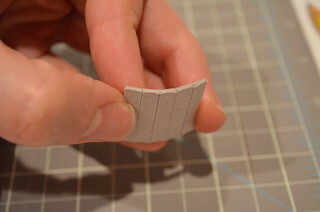 Then slice your 1″ wide strip into brick shapes that are ½” high. You should end up with twenty-four bricks that are 1″x½”. 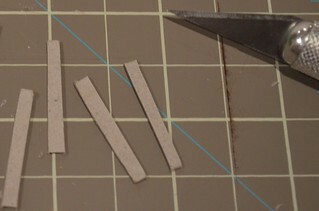 Take seven of these bricks and slice them in half again, creating little half-brick squares that are ½”x½” in size. We’re going to use these to create something of a feature corner on one vertex of the tower, and some of the remainder will form little features on the sides to help break the monotony of the walls of the watchtower. Think of these as being similar to the outlines an artist sketches in to suggest a feature, without drawing every aspect of it. Arrange the bricks as shown – this will make it easier for you to ensure you stick them correctly once you’ve applied the glue. As you can see, I have a half-brick beside a full brick, and then alternating a full brick beside a half. Imagine that the dividing line up the middle is actually a corner edge of the tower. As you can see, the line of bricks is 6″ high, which is exactly the height of our tower. You may need to trim the top bricks a little, depending on how much sand you have in your eaves. Here’s a graphical view of what the tower might look like if you added all the decorations before you assembled it. This is roughly how I laid out my tower, and it doesn’t include any of the locations for the moss, which I’ll show a little later. This is to give you an idea of where to place your bricks. Door and window later. Draw a line about 1″ from an edge of the tower on each face of the tower that you’ll apply the brickwork to (the first two faces in the diagram above). Apply your glue all the way up the tower from the edge to that line. Then take one half of your line of bricks and start sticking them from the bottom up. Once you’ve finished with that side, rotate the tower and do the same with the other bricks, making sure that whatever was a full brick on one side is a half-brick on the other. 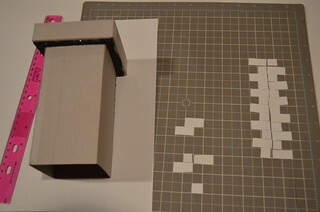 Then glue and place your decorative bricks as shown in the graphic above. Remember that for the decorative bricks, less is definitely more. 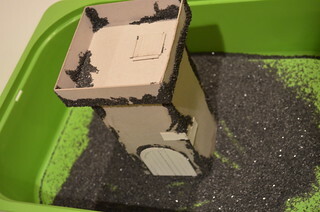 While your glue is still tacky, apply some more up the edges of the tower that don’t have bricks on them, as well as on the sides of the walls of the roof. This is going to be used for more moss/ivy. It’s also a good idea to have a few patches dotted around the walls as well, and in strategic places on some of the bricks you’ve just stuck on. Get your plastic container out and pour sand over all the sticky parts that you’ve just created, making sure to get plenty on there. Make sure and cover everywhere and rotate gently to give the sand a chance to stick. Again, some will fall off after, but don’t worry. While the glue is drying, we’re going to make the front door (so you can get your garrison in there during a battle). There are many different ways to make a door, but I personally like a nice arched look. We’re going to make one that will look like it is wooden with a stone surround. 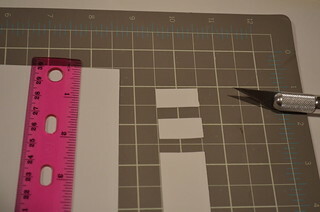 Take some card (the same that you made your bricks out of) and draw a line with your ruler 3″ from one edge. 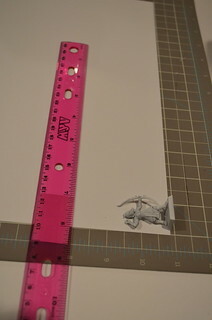 I’ve shown one of my Glade Guard here to give you an idea of the height – the door will end up a little bit smaller than this. Don’t worry about the width of the door just yet, as this will be dictated by the arch that you put at the top of the door. You can of course make a smaller door if you play mainly with Dwarves or Halflings, or you want that sort of feel. The next step is to draw the arch. 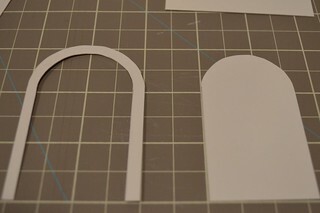 There are a couple of ways to draw the arch, and the method you choose depends on what tools you have available to you. In my kitchen cupboards live many jars of food, spices and condiments and so when I need to draw any kind of circle I grab a lid, can or jar and draw around it. As you can see from these photos, you’ll need two things to trace around, one slightly smaller than the next. 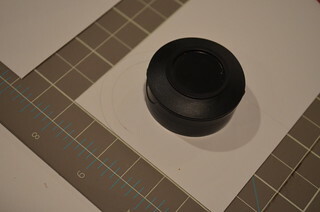 If you don’t have a lot of handy circular things lying around, you can use a compass. You’re aiming for a difference in diameter of about a ¼” which will be the width of your stone surround – feel free to adjust to make it as wide as you like. 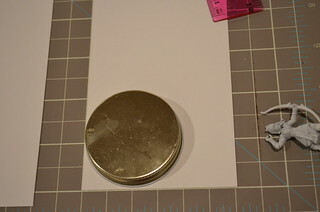 Place the larger lid against the line you drew on your card and next to one edge, then trace a semi-circle around with a pencil. Do the same with the smaller lid, trying to make sure that your lids are centered in the same spot. You should get a nice looking arch as you can see in this image. Continue the pencil lines from the arch right down to the bottom of the card, and on both sides. Then use your craft knife to cut out the entire door. 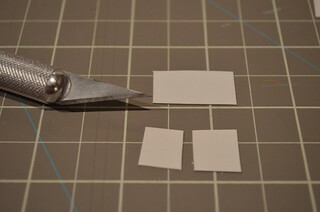 Once you have a door shape, use your craft knife to slowly and gently cut out the surround. Put the surround to one side for a moment. 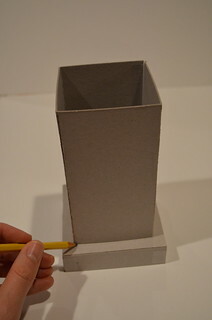 Take your door and place it on your tower where you want it to, then trace around it with a pencil. This is so you know where to put your glue. 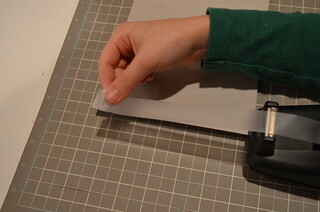 Put the door on your cutting mat and slice it in half vertically with your craft knife. Then slice each half in half, and then in half again (all vertically). This will give you 8 “planks” that make up your door. You can cut less if you want the planks to look thicker. Now apply the glue on your tower where you just drew the outline of your door–make sure and fill the entire shape with glue–then place your planks on the door. I find it easiest to start with the two center ones, and work outward. Leave a little gap between each plank so that it feels more three-dimensional. After you’ve glued all the planks on, take the surround and lay it over the top of the planks so that it overlaps. Your arch will jut out below the bottom of the tower as shown in this diagram. Cut off the bits that stick out. Apply glue liberally to the top of the planks where the surround will be stuck, as well as to the wall of the tower just above and around the arch. 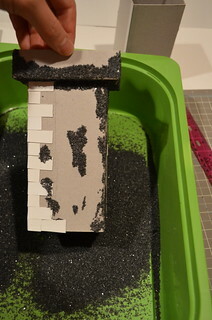 Stick the surround to the door, and then sprinkle the area above and around the arch with sand. This should not only cover the gap between the surround and the tower, but also make for a natural moss or ivy pattern once you paint it. Remember those squares of chipboard you cut out when you were making the roof? Now’s the time to reuse them! Take one of the squares and score along it in five equal lengths to create the look of planks. Use the back of your craft knife as the blunter end should help peel off a little wider amount of card, thus creating a better groove. Once you’ve finished scoring, pick up the square and bend it gently with your fingers to help split the planks apart. Now take another one of the squares and slice four lengths off it. As you can see from this image, the width of each one is somewhere between ⅛” and ¼”. These pieces are going to form the stone frame for the trapdoor, so you can make them whatever width you feel is aesthetically pleasing. Pick a spot on the roof of your tower to stick the trapdoor, bearing in mind that it should be coming up somewhere near a wall of the tower and on the inside. Apply a liberal amount of glue, and stick the door and the surround. You can also apply some sand here if you like, although I felt that this area of the Watchtower was likely to be well-traveled and thus unlikely to have anything growing on it. While this was meant to be an arrowslit, it actually turned out to be a lot wider than you would realistically build one. However, I’m going to continue to call it an arrowslit for the purposes of this tutorial. 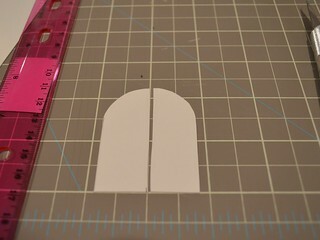 Cut out a card shape that you want to use as your slit – in this case, I created a pointed arch with a flat sill. Stick it on the side that doesn’t have the door or the feature brick corner (see earlier diagram). The final step is to apply glue and sand everywhere that you want to have your moss or ivy growing. In this case, I’ve done it up the side of the roof, both inside and out, around the door, on the bricks and on the walls. This is a good opportunity to apply some more sand to any areas where it might have flaked off already too. 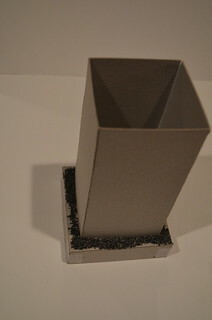 Once the glue has dried, take your watchtower outside and place it inside an old box and spray it black. You may need to carefully lift it in order to spray every side and corner of it. This spray step is helpful in helping the sand remain stuck and in sealing up the card to receive the paint that we’re going to add in the next tutorial. This is the first piece of scenery I’ve built since getting back into the Warhammer hobby, and the main reason is because it’s the most versatile. Despite being a Wood Elf player, I wanted to build a watchtower so that I can use it in the eponymous scenario from the Warhammer Rulebook. In addition, towers look great on the battlefield and, if you build them right, they can be reused in all sorts of other scenery in a modular fashion. But I’m getting ahead of myself. 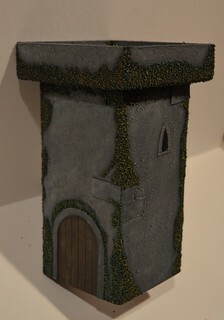 In this tutorial, I’ll be walking you through how to build a watchtower out of chipboard and card stock. One of the things I noticed is that Games Workshop scenery is fantastic, but in order to have 10 pieces of it, you’ll be handing over between $300 and $500 of your hard earned cash and you’ll still have to assemble and paint the scenery. I hope to be able to show you how to build high quality scenery without breaking the bank. I’d like to thank my kids who helped me make the tower and who either posed for some of the photos or took photos of me (or rather, my hands) in others. They are aged 9 and 7 and this level of project is definitely fun for them too, if they enjoy any kind of craft. I’ve divided the tutorial up into a several sections, and Part I focuses only on building the basic structure. By the end of Part I, you’ll have two simple card towers, ready for decorating (Part II), painting (Part III) and basing (Part IV). 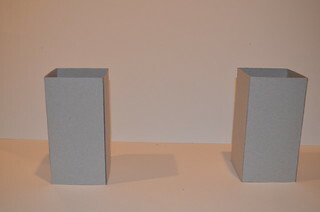 This photo should give you some idea of the size of each Watchtower – without a base it is about 18cm (7in) high. The two figures you see there are Wood Elf Glade Guard which, like the tower, are ready for painting and basing. For those of you who don’t play Warhammer, those miniatures are on 20mm bases and are about 28mm (1.1in) tall. If you have any questions, please leave them in the comments. In case you have none of these things, you can get all of them in your local Jo-Ann Fabrics or Michaels. These stores are very similar, very feminine (so don’t be intimidated) and they always have coupons that you can download from their website to give you a minimum of 25% of your purchase (my wife got a coupon in her e-mail today for 60% off any one item). It’s generally not a good idea to buy these things from a hobby store or Amazon, because the hobby store needs to mark them up and Amazon doesn’t actually sell stuff like this – a lot of it comes from their third-party sellers (check out the “sold by” label) and as a result the prices and quality can vary widely. I bought a chipboard and card set (10 sheets of chipboard, 10 each of black and white card) for $10 at Jo-Ann (Colorbok Board Basics) which is mostly used for scrapbooking. The chipboard is great quality for scenery though. I also bought a big bottle of Elmer’s Glue-All at the same time, and my craft knives are from this X-Acto set (again – check the price at your local craft store as the 25% off coupons can make the purchase cheaper than from Amazon). Take a sheet of 12″ x 12″ chip-board, and mark vertical lines at 3″ intervals with a ruler and pencil (I find it helpful to have guidelines before I start using the knife). 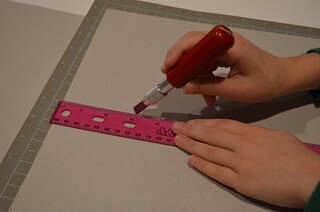 Then score along those lines using the blunt side of the craft knife along a ruler to do this, and then score again gently with the sharp side. You are aiming to score just deeply enough to make it easy to fold the board as shown here. 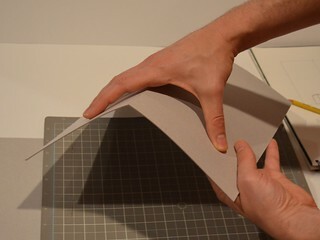 Make sure you score (and cut) on top of a cutting mat or other protective surface. Do not (as I have done) cut up your table surface and then have an angry wife or mom throw things at your head. After each score, pick up the card and gently fold it away from the direction of the score (in this image, I’ve scored along the top of the card). Bend it no more than 90°. Once you’re done with all three scores, you should have a piece of board that looks something like this. Obviously this is too large for a Watchtower, so cut it crosswise in two equal pieces (i.e. cut horizontally across at the 6″ point). This will give you enough to build two towers. Alternatively, you can keep it tall and use it as part of a larger castle. OK, I couldn’t resist the Tolkien reference. This stage is pretty easy, but I’ve laid it out in pictures to show some simple techniques to make life even easier for yourself. 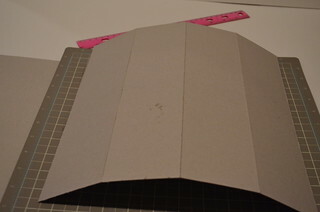 Layout the first 6″x12″ piece of board so that it curves up, with the 6″ end nearest to you and measure out a piece of tape just slightly smaller than 6″. As you can see, my daughter has just pulled tape from the dispenser until it matches the length she needs. You’re going to join the 6″ ends to each other, so stick the tape along that 6″ edge so that 50% of the tape is on the card and 50% sticks out. Then lift up the board and wrap it around and stick the two ends together. 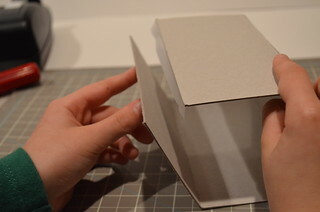 Put your hand (or a paintbrush, or your kids hand) inside the tower to press on the tape firmly so that it sticks well. Get another piece of tape 6″ long and tape it along the join on the outside. 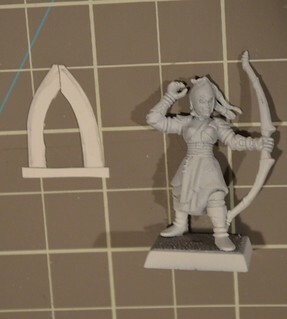 This will create a join that’s strong enough to take the roof of the watchtower as well as stand up to regular game play, and be easy to paint. When you are done, repeat with the other piece of card and you’ll have two simple towers of chipboard. In the next stage, we’ll add a roof that your miniatures will be able to stand on in order to take pot-shots at passers-by. 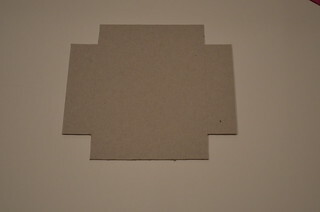 Take another piece of chipboard and cut it in half, and half again. You should end up with two squares that are 6″ x 6″. Inside one square, mark a border with your pencil that is 1″ in from each edge, and use your craft knife to cut out the squares that are formed in each corner. Make sure and keep these squares in a safe place as we’ll use some of them later for adding detail to the tower. 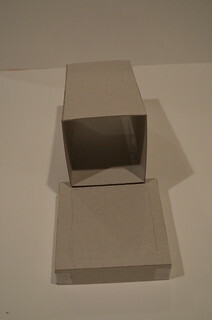 In the next part of the tutorial, we’ll use two of those squares to add a wooden trapdoor in the roof section. If you click through the image above, you’ll see the lines that I drew to mark out the squares. Score along those lines in the same way you did for the tower. Flip the board over and fold up along your score lines to 90° and then tape each corner with Scotch tape both inside and out, just as you did for the towers you created. 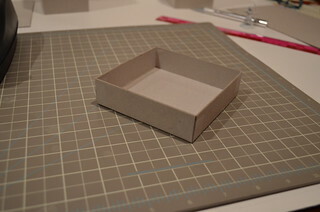 You should then have something that looks like a small box without a lid. 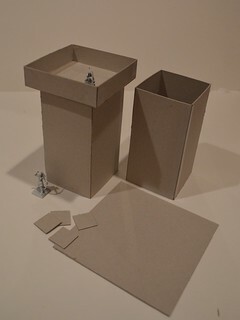 Repeat this process with your other 6″ x 6″ square to make a roof for your second tower. From this point on in the tutorial, I’ll give instructions just for one tower – assume you should just repeat the process for your second model. 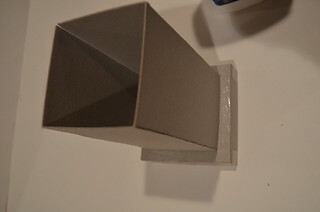 The final step is to glue these two pieces together to make a the watchtower shape. Flip your roof upside down and place your tower on top of it and then mark around it with a pencil. You don’t really need to measure here, just eyeball roughly where the center is (and remember that in mediaeval times, measurements weren’t exact). Spread glue liberally with an old brush, making sure you cover both sides of the lines you’ve marked out. 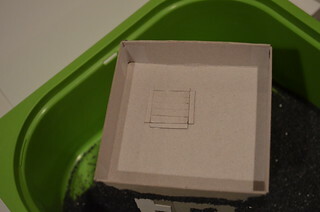 (I actually spread glue right to edge of the roof, because I take this opportunity to add sand – see Part II of the tutorial for more info on this). Place your tower upside down on top of your outline and let it dry. And that’s it! You’ve built a working Watchtower (or two!) that is as yet undecorated, unpainted and unbased, but in a pinch could be used in a battle if you really need some scenery. 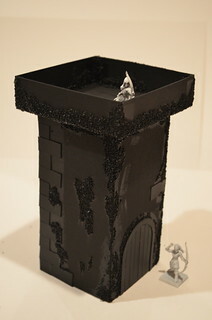 Part II of the tutorial deals with how to decorate your Watchtower and get it ready for painting. Please leave any questions or feedback in the comments. It would be cool to see photos of any you build! I’ve ordered a few things from eBay in the last couple of weeks. There are two main issues that I’ve run into. I’ve found a few good resources that hopefully will prove useful and thought I’d share them. The Dakka Dakka forum has a great thread on stripping paint, which I hope to put to good use on these Dryads. As you can see, the paint was smeared on (at least it was a nice color!) and the model was stuck together without any prep. You should work on the assumption that anything you buy from eBay will have just as bad a paint job, unless they show some really good close-up photos of the miniatures. Also, be prepared for bad smells. Other people may not have the same living habits that you do, and the miniatures you get may smell of smoke, pets or even just chemicals from non-acryclic paints. You have been warned. As for army books, Wikipedia has an excellent list of each Warhammer Army book, including it’s ISBN, what edition it came out for and when it was superseded. This makes it easy to identify whether someone is trying to sell you the latest version of the book or an older (and obsolete) copy. Ever since I first read about and tried a wet palette, I’ve been evangelizing them to anyone who’ll listen (including my long-suffering spouse!). Things have now reached the point where quite a few people have asked me where to get one / how to make one. 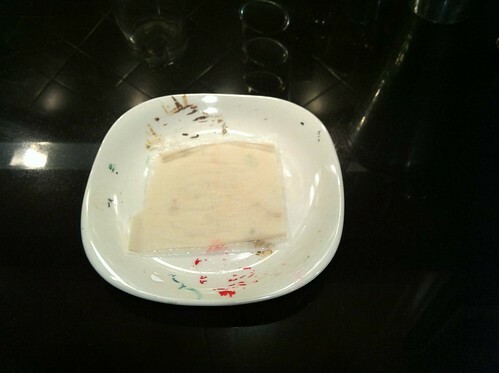 This simple tutorial shows you how to make your own wet palette, using simple and cheap materials. It will take less then five minutes to make one and cost only a couple of dollars to make one, so don’t panic. Quite simply, a wet palette is a place for you to mix your paints to the color and consistency that you want (like any other palette). 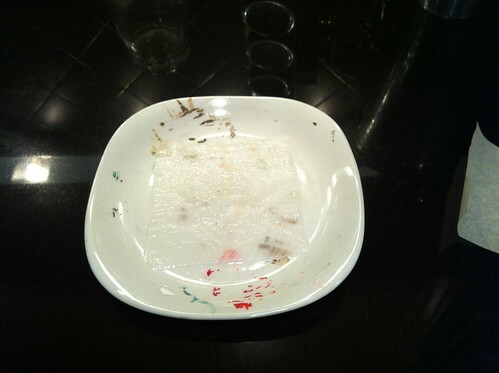 The neat part about it is that the paint does not dry out while on your wet palette, and maintains the consistency that you mix it too for several hours. “How does this work?” I hear you say. 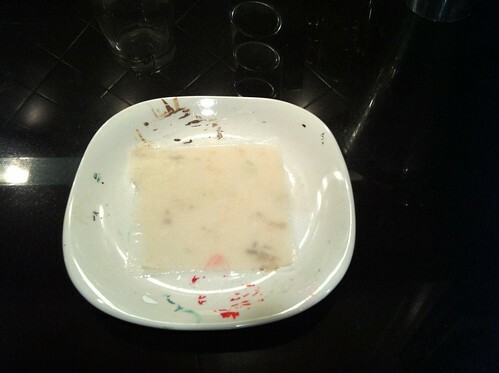 A layer of parchment paper forms a semi-permeable barrier between a wet layer of absorbent material (in this case, toilet paper) and your paint. It lets just enough moisture through to replenish the water lost from evaporation. The end result is that you waste less paint and stop getting frustrated because you’ve run out of the color you just mixed, or because someone interrupted you for 20 minutes and now your paint has dried out. A nice side benefit is that the wet palette is quite soft, when compared to a dry palette like a tile or one of those pre-made painting palettes. This means less inadvertent damage to your expensive brushes, prolonging their lifespan. Now, on to the tutorial! From left to right: a plate that curves up around the outside (most do, but it needs to be a plate rather than a tile for this reason, and square works best because of the shape of the toilet paper); two segments of toilet paper used to hold the water; a piece of parchment paper cut to the same size as one of the segments of toilet paper, which is your palette. 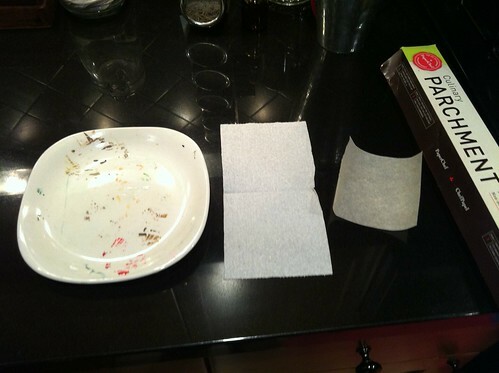 Fold the piece of toilet paper at the join and put it in the middle of your plate. 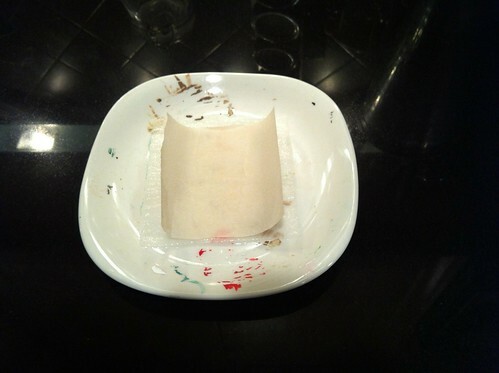 Thoroughly soak the toilet paper with whatever water you use to mix your paints. Some people use distilled water here, but I’ve yet to see a real advantage in doing this (I reserve the right to edit this in the future if I ever become a distilled water convert! ), so for me I just put this under the tap and turn it on very gently. You want enough water that the toilet paper is thoroughly soaked, but not so much that it’s swimming. A little excess in the plate is fine. Take your pre-cut piece of parchment paper and place it directly on top of the wet toilet paper. As you can see, the dry parchment paper curls in the direction it was rolled. Don’t worry about this. Once the parchment paper starts to absorb a little of the water, the curl should naturally flatten out. If it doesn’t, just use your finger to gently flatten it down. Once it’s completely flat, it often starts to curl in a transverse direction to how it was curled on the roll. Just leave it alone for a few seconds and those curls should also flatten down of their own accord. 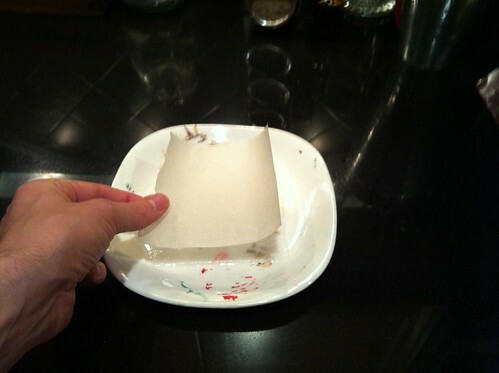 Pick up one corner of the parchment paper and peel it off the toilet paper. Flip it over and put the dry side down on top of the toilet paper. There will be two things you’ll notice. 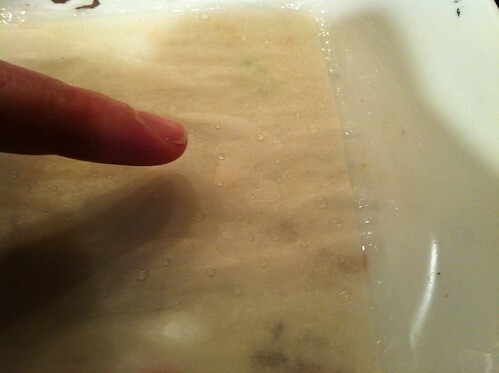 The first is that there are water droplets on the top of the parchment paper now. These are fine, just ignore them – I usually use them to thin down the paint as I put it on the palette, but you can remove them with a gentle dab from kitchen paper if you so desire. The second thing you’ll notice (seen above) is that there are air bubbles underneath your parchment paper. Use your finger to gently push those toward the edge of the parchment paper such that as much of the paper as possible is in direct contact with the toilet paper underneath. 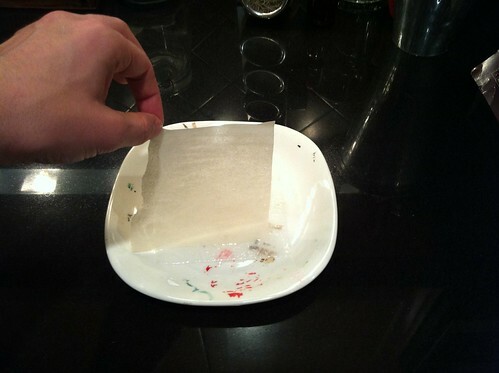 This ensures the continuous transfer of moisture from underneath the parchment, and allows your palette to be the full size of the parchment paper. And that’s it! 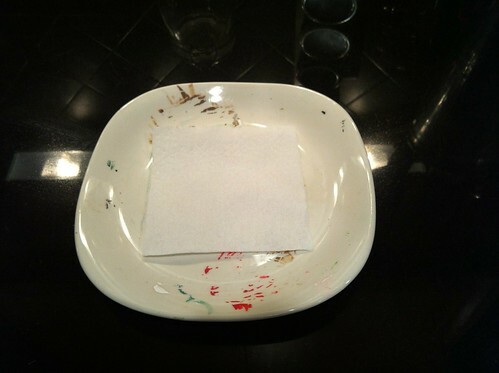 You now use the surface of the parchment paper in the same way as you’ve used your tile/plate/plastic tray up until this point. Generally, I paint for 3-4 hours at a time and I use just one piece of parchment in that time. If I know I’m going to paint the next day, I’ll store this away somewhere airtight (in a tupperware container usually) and then bring it out again the next day – the paint will still be wet. I generally toss the whole lot after two sessions though, just to stop any unexpected side effects like mold. Hope this helps you in your painting!